HomeNewsDid al-Shabaab kill 21 Ugandan soldiers? Did al-Shabaab kill 21 Ugandan soldiers? 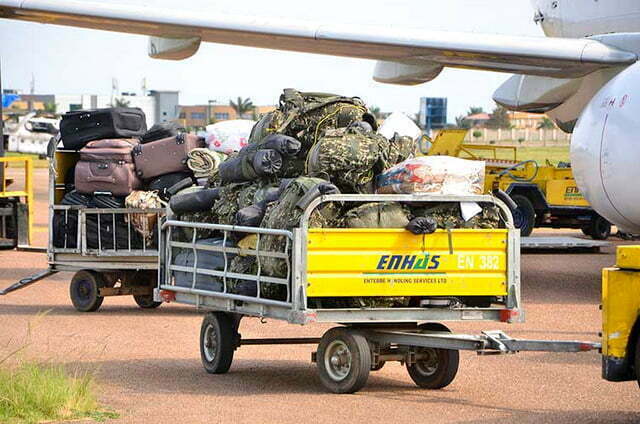 Caskets containing the remains of UPDF soldiers on arrival at Entebbe. Courtesy Photo. Several weeks later, there is still controversy over the exact number of Ugandan soldiers killed in Somalia by the al Qaeda-linked al-Shabaab militants during a July 30 attack. The Ugandan soldiers were killed in an ambush by the insurgents during an African Union Mission in Somalia (AMISOM) patrol. The ambush spot is reported as Gorowen, an area between the townships of Bulumaler and Beladamini in Lower Shabelle region, 140 kilometres southwest of the capital Mogadishu. The al-Shabaab claimed that they killed 39 out of the 59 Ugandan soldiers who were in the patrol, but the Ugandan army insists 12 soldiers died in the attack with seven others injured, some seriously. Despite the UPDF claim of 12 dead, the number could be higher than is being officially claimed. The Somali government put the number of the dead at 23. Sources in Somalia, international agencies and sources within the UPDF told this publication off the record that 21 UPDF soldiers died in that attack while nine others were injured. The sources further reveal that by late evening on July 30, at least 19 bodies were kept at the Level 2 hospital in Mogadishu. The attack has reignited the discussion on how the Uganda People’s Defence Forces (UPDF) manages its casualty numbers. 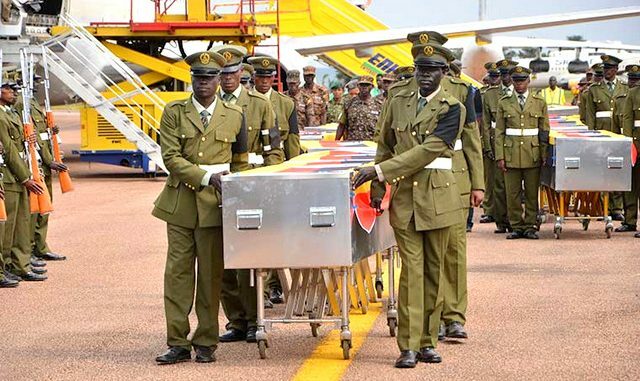 On Wednesday, August 2, caskets the army said contained the remains of the 12 soldiers were brought back to Uganda. Brig Karemire also vehemently refuted the claim of higher casualty numbers than what the army stated officially, dismissing it as al-Shabaab propaganda. “I will really not go into your speculations. I have already told you. Whom do you believe? Do you believe al-Shabaab? Do you know what al-Shabaab is saying? They’re are saying; we have killed one million Ugandans. Do we have one million soldiers in Somalia? Do we have them here in Uganda?,” he angrily said. The soldiers numbering 59 were reportedly under the command of one Lt Baraza who was due to retire from the army. He is said to have survived the ambush. Sources also say during the ambush, 25 soldiers escaped and ran back to their base located four kilometres from the ambush scene. Brig Karemire dismisses this claim too saying the ambush took place far away from the base. 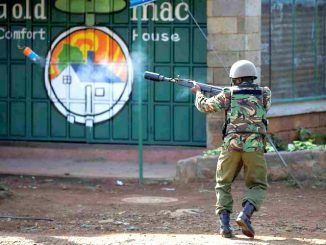 Sources say the patrol was simply outnumbered and outgunned, as the ambush was laid by over 200 heavily armed al-Shabaab fighters. The sources say “there was nothing like fighting back”. Sources also say on the day of the ambush, four UPDF soldiers were missing from the base, but the following day, two reported at the AMISOM base with their guns. The remaining two, according to the sources, were hanged by the al-Shabaab in the town of Gorowen. More reports also say during the ambush, the al-Shabaab fighters undressed and disarmed their victims, taking away uniforms and guns and equipment. Sources say the al-Shabaab fighters took 21 sub-machine guns, five PK machine guns, a 60-milimeter mortar, and five tetra radios. Brigadier Karemire appears to be reading from the same script-book used in 2015 by his predecessor, Lt Col Paddy Ankunda. Karemire took over from Ankunda in January this year. But four months earlier, Lt Col Ankunda was at the centre of shaky information management following yet another deadly al-shabaab attack on the AMISOM forces. On September 1, al-Shabaab militants carried out a suicide car bomb attack on the AMISOM base in Janaale district in the Lower Shabelle region, some 80 kilometres southwest of Mogadishu. Initial sources reported that up to 50 Amisom soldiers had died while the Somali military sources said 37. Two days later, however, Lt Col Ankunda tweeted that the estimates of more than 50 deaths was a fabrication, insisting later that only 10 Ugandan soldiers had been killed in Somalia. Luggage of the fallen soldiers returned home. Courtesy Photo. On the same day, September 3, 2015, General Jeje Odongo, then minister for Defense told the parliament that indeed 10 soldiers had died, but added that 46 al-Shabaab fighters had also been killed in action. He further told parliament that the UPDF had captured “some militants”. Three days later, on September 12, President Yoweri Museveni added yet another piece to the puzzle of numbers, telling the media while on visit to Japan, that 19 Ugandan soldiers had been killed in the Janaale attack. The president further revealed that six soldiers were still missing. He blamed his commanders for being “asleep” something he said enabled the militants to carry out the attack on the Amisom base. Sounding tough, President Museveni further told the media in Japan that the commanders had been suspended. It emerged later that at least one UPDF soldier, Private Masasa, was indeed in the hands of al-Shabaab. 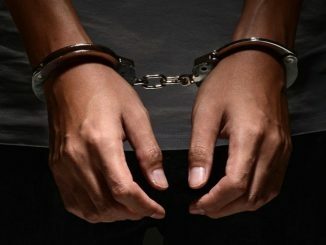 A video recording of his purported execution emerged in January this year. On the evening of July 30, 2017, hours after the al-Shabaab attack, Brigadier Karemire issued a statement which was in many ways similar to the ones Lt Col Ankunda issued in 2015. In the first press statement Brig. Karemire said al-Shabaab attacked a joint patrol of Amisom and the Somali National Army (SNA) forces and that lot of damage was inflicted on the enemy. “…our troops took fatalities whose number is yet to be ascertained and will be made known as the situation evolves. We salute the gallant officers and men who have made sacrifices to ensure that peace is restored in Somalia,” Karemire said. It was on Monday, July 31 that Brig Karemire released another statement quoting the figure of 12 deaths and seven injuries. Just like in 2015, however, the army released no names of the dead insisting that they had to inform their relatives first. Even on August 2 when the 12 bodies were brought home, no names were released, at least not officially. “The UPDF office of Chief of Personnel and Administration is contacting the next of kin of the deceased and injured to inform them of the developments while arrangements are being made to transport deceased comrades to their homes of origin for descent burial,” he said. Last week, a list containing 21 names, purported to be those of the victims of the July 30 attack, was circulating on social media. When contacted, Lt. Col. Deo Akiiki, the deputy UPDF spokesperson insisted it was “fake. “We are not going to keep reacting to fake lists on social media. Our position still stands; that we lost 12 combatants and seven others were injured,” he said. According to the source in the UPDF, so scant has the information about the July 30 attack been that it took a military officer based in Northern Uganda days to know that his relative was among the dead.